It was April 1997, and the Hartford Whalers Team Store was in the process of shutting down. 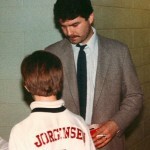 Most Whalers merchandise went quickly, as die hard fans knew it would be difficult to find authentic Whalers merchandise once the team packed up after the final game. Looking for a deal, my brother walked into the gift shop and looked around at what was left. He spotted something behind the counter and walked up to the clerk. Twenty bucks later, the item was his. Now, after years in storage, we have uncovered what we consider a great find. The original answering machine (still working!) from the Hartford Whalers Team Store at the Civic Center, complete with authentic outgoing message and numerous incoming messages left by customers in the final months. 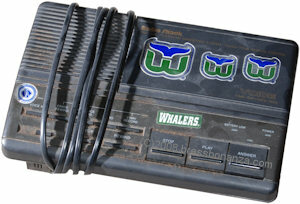 And yes – that is a picture of the actual answering machine that was used in the Hartford Whalers Team Store. I want that as an MP3 so I can use it for my voicemail recording.